Three Storms: The Perfect Storm? Extreme weather has affected three states in as many regions of the United States. In the East Coast, North Carolina was hit by a tornado, while Texas wildfires scorched the Southwest, and a cold snap in the Midwest caused snow to fall in Michigan. The tornado in North Carolina killed twenty-two people and damaged or destroyed more than 800 homes. Meanwhile, wildfires have scorched Texas for days, consuming over a million acres and making the situation critical in the Lone Star State. 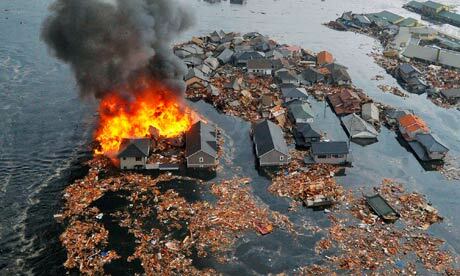 So far, 110 homes have been destroyed and hundreds more could be threatened. In Michigan, record-breaking snow fell this April, bringing about seven to nine inches of wet, heavy snow, which has bent trees, snapped power lines and shut down schools throughout the Wolverine State. 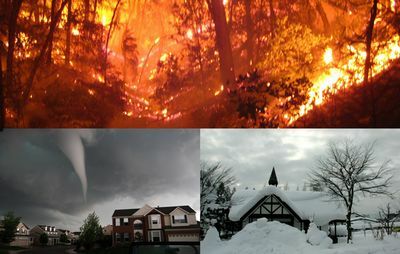 Can the tornado, wildfire and snowfall be related to one storm? I believe that these storms could be related. The cold front from the north can send tornadoes ripping throughout other regions. April 2011 is said to go down as a record month for tornadoes. The heavy drought in Texas may be due to the same cold front headed towards the east instead of the south, resulting in the spread of wildfires throughout the state. The best thing you can do to prepare for these natural disasters is to have safety kits in your house and an emergency plan. Don’t forget to set aside food and water that will last for at least two weeks.